I used to love the original version of these chips that were Tato Skins but they were made by Keebler, I’m not sure when the transition was made to another company but I guess it has been some time now. Tato Skins, which seem to only be sold at Dollar Tree, are like pringles in the way that they are made from dehydrated potato but have a browned side that resembles (or is supposed to resemble) the skin of a potato and therefore…better for you? I used to think so when I was a kid anyway. First I’d like to apologize for the terrible pictures, I’m not sure why all my close ups have the same quality of lost footage from a bigfoot expedition but you get the idea. 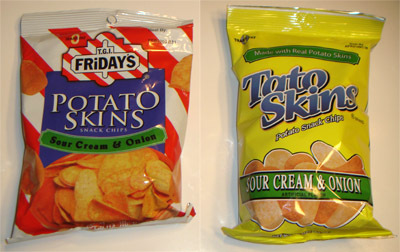 Tato Skins had an okay crunch, the sour cream & onion flavor was somewhat sweet and had good potato flavor. Friday’s Potato Skins were very similar, we found the flavor powder was kind of tart and it overshadowed the potato flavor of the chip. We also thought it had a slightly better crunch. These chips are basically the same thing, we found out they are marketed by the same company but somehow the Tato Skins do taste more potatoey and if I had to pick a bag to have again I’d pick those, but I can’t guarantee I’d know the difference if someone put Friday’s in a bowl and told me they were Tato Skins. Either way, I think they both are a nice change of pace from the everyday potato chip. I don’t eat no Taters…………….. only snyder’s sunny chips. Check out the Food Network, show-UNWRAPPED (air date 6/25/11). they did a segment on TGIFriday’s Potato Skin Chips. There are several new flavors that look good. I think the Walgreen’s stocks these chips in the larger bags. The flavor may be a little more tangy, but it seems to me that the flavors of most seasoned foods have been heightened in the past few years.